Dawnus – on behalf of the council – is currently carrying out the £12m Kingsway infrastructure project, set to transform one of the key arteries into and out of the city centre. The Swansea-based company was keen to support business in the area who may have faced disruption during the works, and to show its appreciation for their patience while the project has unfolded. Mathew Morgan, the Regional Director of Dawnus, said: “After meeting with Swansea BID to discuss ways in which we could support the city centre, we are pleased to back local firms on Small Business Saturday, by helping to fund this parking offer. Our construction team has worked very hard to complete works to The Kingsway South – the traffic switch over has now been successfully completed and the barriers have now been removed, to allow shoppers to access the area easily. Swansea BID Chair, Juliet Luporini, said: “We are delighted to partner with Dawnus Construction on this great offer, which will help boost footfall to the city centre on the key trading day of Small Business Saturday. I would encourage shoppers to take advantage of this opportunity to support local businesses and to make a good start on their Christmas shopping. We are fortunate to have a great mix of big names and smaller, independent businesses in the Swansea BID area, all of whom are gearing up for a lively Christmas period. There are already a number of incentives in place to encourage shoppers to head to Swansea in the run-up to Christmas and the New Year, with this new initiative and with the current free parking offer after 3pm at St David’s Multi-Story Car Park Monday to Saturday. Swansea city centre is very much open for business. 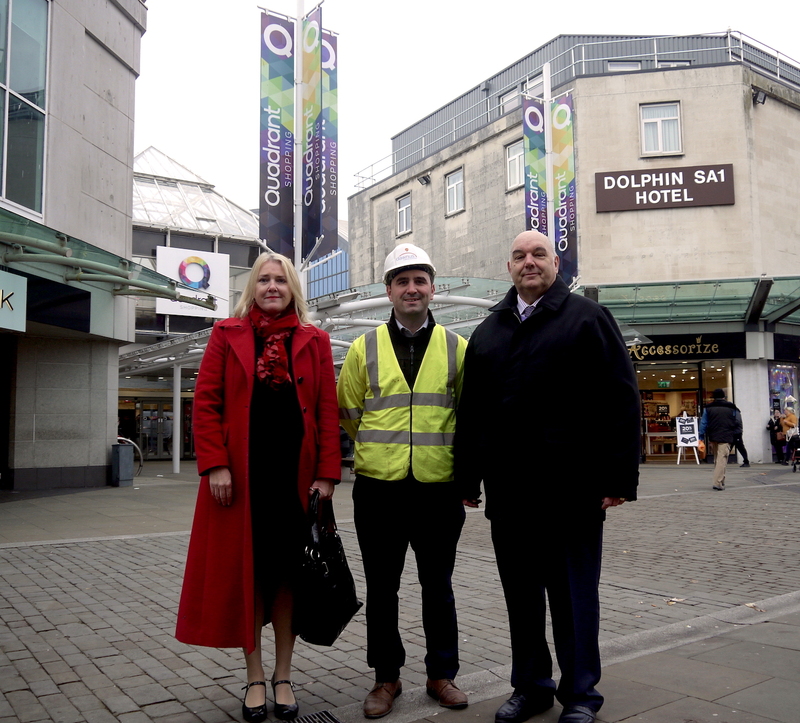 Robert Francis-Davies, Swansea Council’s cabinet member for Investment, Regeneration and Tourism, said: “We’re delighted to be working with BID and Dawnus to promote this free parking offer at the Quadrant and St David’s multi-story on Small Business Saturday. Small businesses are vitally important to our city centre now and to the area’s success in its very bright future. Our regeneration under way, including new city centre homes, a dramatically improved Kingsway, the digital village and the 3,500-capacity digital arena, will transform the area.